During the 14 days that we spent on the water surrounding Saipan, Tinian, and Aguijan, we surveyed over 1500km of trackline. We had 13 encounters with 5 different cetacean species (bottlenose dolphin, Cuvier’s beaked whale, false killer whale, Mesoplodont beaked whale, and spinner dolphin) (Figure 1). 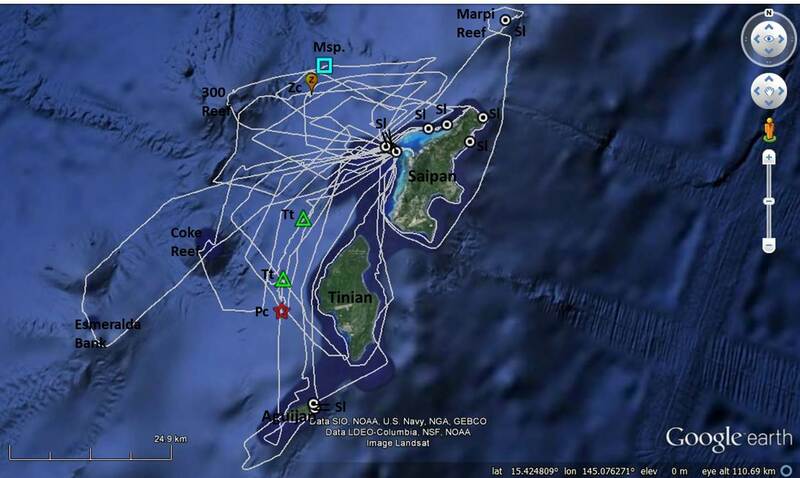 Figure 1: Tracks (grey lines) and cetacean encounters off Saipan, Tinian, and Aguijan (30 May – 14 June, 2014) Msp. – Mesoplodont sp. (Mesoplodont beaked whale), Pc – Pseudorca crassidens (false killer whale), Tt – Tursiops truncatus (bottlenose dolphin), Sl – Stenella longirostris (spinner dolphin), Zc – Ziphius cavirostris (Cuvier’s beaked whale). Spinner dolphin (Stenella longirostris) encounters dominated our surveys as they usually do; 10 of 13 encounters. There are locations along the northeast sides of both Saipan and Aguijan where we find them reliably (Figure 1). The conditions at these particular areas are always rough because of currents and backwash from the cliffs, even if it isn’t very windy. They clearly have a higher tolerance than we do (makes for a very bumpy boat ride). A habitat analysis is planned for this summer to try and figure out what is so attractive about these and other locations where we find them every time we survey. This year at Marpi Reef we photographed an individual that to date is our longest distance traveler between the Southern Mariana Islands (Figure 2). This individual was photographed off the south side Rota in 2011 then at Marpi Reef in 2012. The straight-line distance between these locations is 162 km (88 nmi). Figure 2: Spinner dolphin photographed of Rota and Marpi Reef (a distance of 162 km) (photo credit: Allan Ligon and Adam Ü). This year we have had more beaked whale encounters than any other year. During our surveys off of Saipan, Tinian, and Aguijan we had 2, which bring our total to 4 this year. Both encounters were off the northwest side of Saipan (Figure 1). The first was a Mesoplodont beaked whale, possibly a Blainville’s (Mesoplodon densirostris), occurred on 1 June. The lack of scarring on the body and the lack of erupted teeth from the lower jaw suggest that it was a female or young animal. The second encounter occurred on 4 June and was with a group of 3 to 4 Cuvier’s beaked whales (Ziphius cavirostris). One was an adult male with erupted teeth (Figure 3). 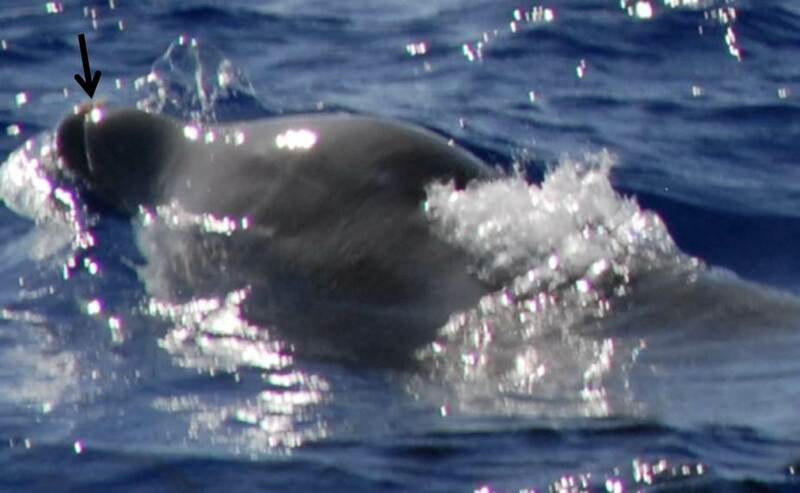 This was our first confirmed encounter with Cuvier’s beaked whales here in the Marianas. Figure 3: The head of an adult male Cuvier’s beaked whale. The black arrow is pointing to the two teeth that have erupted from his lower jaw (photo credit: Adam Ü). On 12 June, we encountered both false killer whales (Pseudorca crassidens) and bottlenose dolphins (Tursiops truncatus) off the west side of Tinian (Figure 1). The 9 false killer whales that we photographed were different individuals from our encounter off of Guam in May, and the two false killer whale encounters off Rota last year. We collected biopsy samples from 7 individuals. We deployed two satellite tags; one that will give us location only (tag ID# 128901) and the other that will give us both location and dive depth (tag ID# 128888). The track of the false killer whale’s locations 12-18 June is pictured in Figure 5. The second false killer whale, tagged during this sighting (tag ID# 128901), is traveling with the first (not pictured). 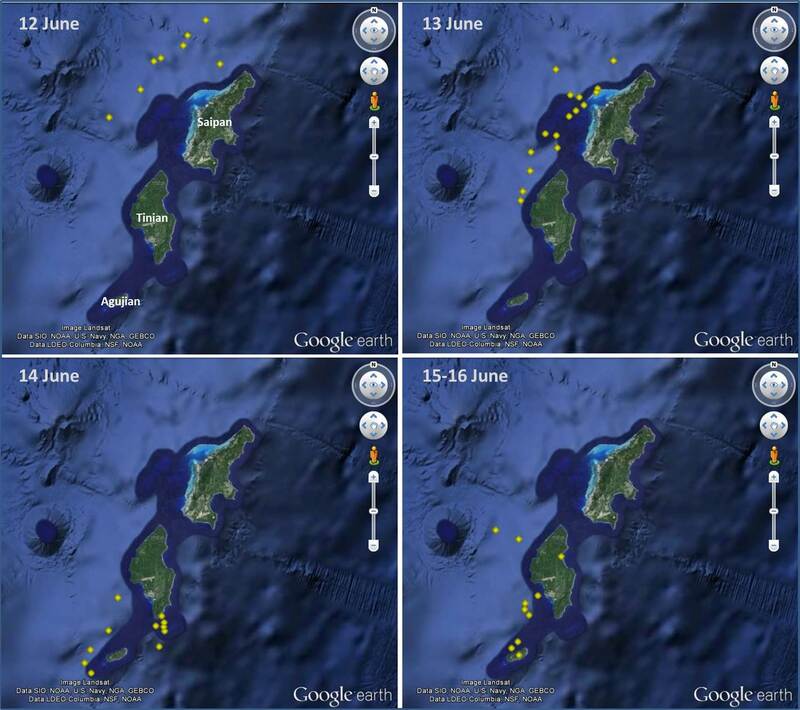 After being tagged on 12 June they moved north beyond Saipan to Farallon de Medinilla (FDM). This is of particular interest because of the high level of military activity on and around FDM. The tagged false killer whales then moved west to Anatahan and beyond before traveling north toward Guguan and Alamagan (Figure 5). They returned south and were off the west side of FDM on 18 June. As of 19 June, both tags were still transmitting. 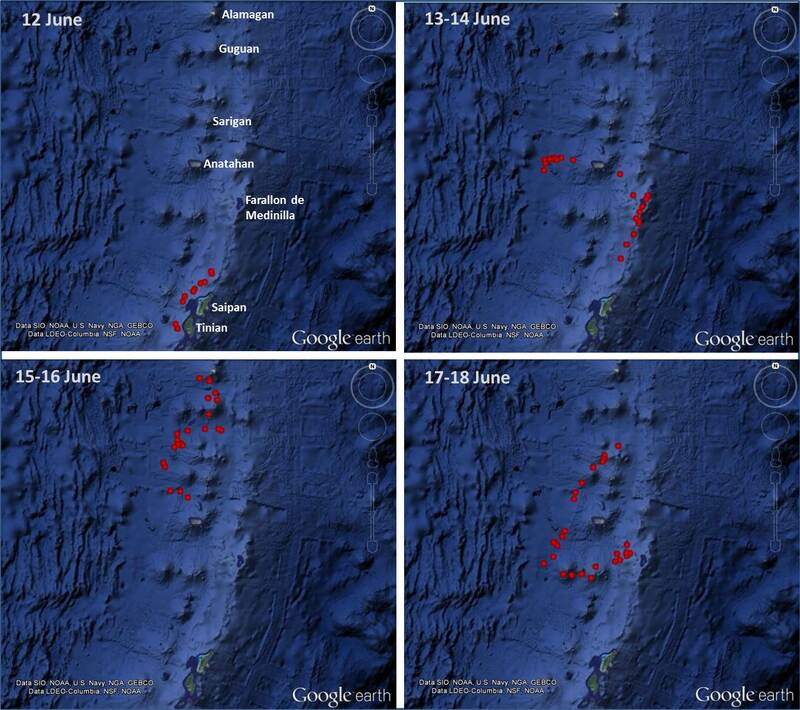 Figure 5: Tracks of satellite tag ID# 128888 deployed on an adult false killer whale off of Tinian on 12 June 2014. Within the group of sixteen bottlenose dolphins we recognized a few individuals from our photo-identification catalog, but others were definitely new individuals. We deployed a satellite tag (tag ID# 128912) on an adult individual. The satellite tag locations are pictured in Figure 6. The final transmission was received on 16 June. Figure 6: Tracks of satellite tag ID# 128912 deployed on an adult bottlenose dolphin off of Tinian on 12 June 2014. Our next and final stop is Rota where we will spend five days on the water. All survey operations including satellite tagging, photo-id, and biopsy sampling were conducted under NMFS permit 15240 and CNMI Fish and Game License 14-02868. Funding was provided by the NOAA Fisheries and the U.S. Pacific Fleet. The satellite tag tracks shown are based on raw transmission data and have not been quality checked. The final products may vary from those shown in the figures above. This entry was posted in Protected Species and tagged beaked whales, bottlenose dolphins, cetaceans, false killer whales, Mariana Islands, NMFS, NOAA. Bookmark the permalink.